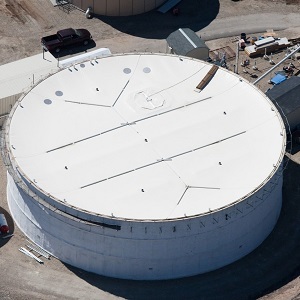 Geomembrane Technologies Inc. (GTI), a Global Cover and Liner Inc.® company, supplies custom tank and lagoon covers as well as containment liners to satisfied customers worldwide. Home / Companies / Geomembrane Technologies Inc.
Not a current GTI customer? Let our experienced team assess conditions at your facility, provide recommendations, and help you implement them. We employ expert professionals who happily service your cover or liner systems even if they were not provided by Geomembrane Technologies Inc.. Contact us to discover how our products can solve your problems, and visit our website! Collect valuable biogas from anaerobic digestion systems with a GTI gas collection cover.